As the hands play such an important part in controlling the horse, riders need good quality riding gloves. 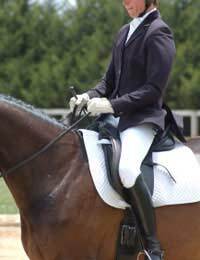 It is impossible to grip the reins properly if your hands are cold, so in the winter gloves are a must. But ordinary gloves will be too slippy to hold onto the reins properly, so investing in a good pair of specialist riding gloves is a good idea. The best riding gloves are usually leather. It is both hard wearing and warm, and looks smart and professional – ideal for competitions. However, depending on the type of leather used, sometimes you may end up with a less than optimum feel of the reins. In order to combat this, many riders are now turning to Lycra or Spandex. These materials give you a close fit and are highly flexible. It actually will feel like you are not wearing gloves if they are a good fit. They should have lots of rubbery grip dots on the palm to avoid your hand slipping. Finally, many riders, especially beginners, choose a cotton or wool mix. These types of gloves can get wet and cold easily when it rains and are not particularly hard wearing. However, they can, at least, be washed easily. They will also have lots of grip dots on the palm to hold onto the reins. Whichever fabric you choose, make sure you break them in, especially if they are leather, as, like boots and shoes, they will become uncomfortable if they have not be worn prior to riding in them. Riding gloves can have several features which makes them more comfortable and more safe. The first thing to look for is the grippy dots mentioned above. These are invaluable in maintaining a grip on the reins. It is dangerous to use gloves – certainly those of wool and Lycra type materials – which do not have these dots on the palms as you could lose your grip on the reins easily, thus losing control of the horse. Many pairs of riding gloves also sport a wrist closure. This can be in the form of a buckle or Velcro fastening. This closure can help to ensure a tight fit and also helps your gloves to look smart where they meet the sleeve of your jacket. How to clean your gloves depends on the type of material, but it is important to wash them thoroughly, just as you would any other piece of equipment. Dirt can build up on them quickly, and, if they are leather they can crack, and non leather gloves can get slippery, not to mention begin to smell! Make sure the gloves you buy are washable in a machine unless you opt for leather, which should be wipe clean. Most Spandex gloves can be rinsed after riding to eliminate most of the dirt, and if you remember to do this, the stubborn marks will not remain on them. If you do not and only wash them periodically, they will start to look grubby with ingrained dirt. In terms of what to wear around the stable, it certainly pays to have a second pair for mucking out and even grooming and keep a main pair for riding. Gloves are inexpensive compared to a lot of riding equipment but this does not mean they should be forgotten about. They are necessary to anyone who plans to continue riding into the autumn and certainly the winter. In these conditions, they certainly make riding safer, but also much more pleasurable as your hands will not turn blue after a few minutes in the saddle.